We were cautiously threading our way through the fog on the A33 from Strasbourg to Nancy in northeastern France when we crested a hill and caught our first glimpse of the giant 2 MW RePower turbines. Wind turbines of this size are seldom difficult to find and these were no exception. We had only learned of the project a few weeks earlier when we received a press release from ADEME (Agence de l'Environnement et de la Maitrise de l'Energie), the French energy agency. ADEME's press release touted the project, in which it played no small part, as the first of its kind in France: a cooperative of neighboring landowners. Since I had spent the better part of two years working with groups in Ontario who wanted to develop cooperative or community-owned renewable energy projects, Le Haut des Ailes became a necessary detour on our trip to Germany's burgeoning solar and wind industries. My reasoning was simple, "if the French can do it, we can do it in Ontario as well," so we quickly added "Le Haut des Ailes" to our European itinerary. What I didn't know at the time was that we were following the Route des Energies Renouvelables-the renewable energy road, a suitable metaphor for our journey in Lorraine. Of course the Germans and the Danes had built their renewable industries on the backs of local ownership, but there's always that nagging doubt that they are somehow different from everyone else. A quick trip to Lorraine could shed some light on how the French approached the problem. After all, the French language is the "other" official language of Canada and the French experience could be helpful to francophones in Manitoba, Ontario, Quebec, and the Maritimes. The ancient province of Lorraine wasn't far off our track from the "solar city" of Freiburg, Germany, where community ownership of renewable energy is the norm. Just west of Alsace, Lorraine is a hilly agricultural region not previously known for wind energy. Until recently, the French have been slow to embrace wind energy, accustomed as they are to adopting large, central-state solutions to energy problems, notably with nuclear power. This began to change with the introduction of the French electricity feed law in 2001. Wind energy has finally begun to take off. France installed nearly 400 MW in 2005, twice that of the year before, and Le Haut des Ailes was part of the surge in projects. The project would have never been built without the feed law. Only in countries using electricity feed laws, such as Germany and Denmark, have community groups or farmers been able to participate in renewable energy development. Le Haut des Ailes is the first example of this phenomenon in France. Located on a series of gently undulating ridges north of the A33 between Sarrebourg and Nancy, Le Haut des Ailes is not a small project, by any standard. Its 32 MW are comprised of three distinct clusters totaling 16 turbines, reflecting the unique requirements of the French feed law. Two projects, La Tournelle and Le Haut des Grues, are each 10 MW. Le Haut des Masures is 12 MW. All are centered around the village of Igney. Under previous law, projects were limited to 12 MW for political reasons. This restriction has since been lifted. Though developed collectively, each is connected separately to nearby 20 kV lines, the distribution voltage for the region. As in much or rural France, or "La France profonde," the villages here are small and not very distant from one another. Farms are small and the land is subdivided into small parcels. Roads are narrow, and villages "picturesque" to a North American. Built in Husum, Germany, the RePower MM82 are big machines that each sweep 5,200 square meters of the wind stream. The MM82 follows a conventional design using a gearbox and doubly-fed induction generator. The variable-pitch blades on the MM82 are distinctive when the turbine is seen at rest. This is the way we first saw them as they rose up out of the fog that day in early winter. To reduce the chance that the tip of the blades will flex too much in high winds and strike the tower, RePower imparts a striking curve to the blades so that they bend away from the tower. This is unique to RePower. Other manufacturers solve the problem differently. In Le Haut des Ailes, the 2-MW turbines stand atop 80-meter tubular towers. Each turbine is serviced by a well-designed gravel access road is expected to produce 4.6 million kWh per year at the 6.4 m/s site. François Pelissier, deputy mayor of Nancy France and driving force behind Le Haut des Ailes. Photo by Paul Gipe. Le Haut des Ailes was developed by the Groupe Erélia, an innovative company led by a prominent young politician, François Pélissier, and engineer David Portales. Pélissier is an assistant mayor of Nancy, Lorraine's regional capital, and has made a name for himself with his enthusiasm for community development. Articulate and thoughtful, Pélissier is eager to tell the story of Le Haut des Ailes and what it means for the people living nearby. "Sustainable development is not solely about the environment or about energy," says Pélissier, "but also about social cohesion, about giving something back to the region." To him renewable energy is a vehicle for local and regional development, for putting more money into the pockets of landowners and the villages in which they live. The project was financed with 20% equity and 80% debt, fairly typical for continental wind projects. Pélissier and Erélia wanted to keep the majority ownership in local hands to force redistribution of the benefits locally. As a consequence, 99 local and regional investors-80% of whom live within 10 kilometers of the project--provided 10% of the total project's cost. (The number of investors was strategically chosen. Projects with 100 or more investors require approval of the investment's prospectus by French regulatory authorities.) Individual investments ranged from 1,000 Euros to 30,000 Euros each. Participants included retirees, farmers, professionals, and executives. Interestingly, some invested in the names of their children or grandchildren, truly making an investment in the future. FIDEME (the French Environment and Energy Investment Fund) provided the remaining 10% of the equity. The remainder of the 35 million-Euro project was financed with a conventional bank loan from Entenial. Erélia invested 600,000 Euros in up-front costs to get the project underway with consultant studies, wind resource assessments, and the refurbishing of what would become the visitors center. Pélissier expects the project's return on investment to be at least 7%. This target, while low by North American standards, is not unusual among cooperative projects in Europe. David Portales, consulting engineer and one of the principals in the Erélia Groupe that developed Le Haut des Ailes. Photo by Paul Gipe. For France, the project moved with lightning speed through the planning process. It took only 18 months from the inception to the winning of building permits. Despite 50 communities and two departments being affected by the project, permits were approved without any objections. This would be noteworthy anywhere, but in northeastern France it's particularly so because so few wind turbines are in operation and many in rural France get their news from their neighbors-a recipe for death by rumor mill. Pélissier attributes Erélia's success to its efforts to work with the community and respond promptly to questions from neighbors. This is especially important in rural areas, or else rumors spread quickly, says Pélissier. Once a rumor starts, it's very difficult to counteract. Pélissier says Erélia's first act was to begin renovating a disused historic structure in the village to serve as an office and visitors' center. The investment paid off because it forced Erélia's staff to work in the community, where they could quickly respond to concerns and quell rumors. Their policy was to be in the village two days every week during the project's development. Sign posted hiking trails (Circulaire Haut des Ailes) in the vicinity of Le Haut des Ailes, showing distances. Photo by Paul Gipe. This was a wise move, as locals didn't believe the project was real until they saw Erélia building the exhibition hall. Now 400 visitors pass through the building at Igney, the village at the center of the development, each month. Erélia also established a 12-point charter of agreements outlining how the project would be built sustainably, and specifically how it would benefit the communities affected. The charter offered reassurance to the area's villagers as well as providing Erélia with a guide how to judge project costs and benefits. As a politician himself, Pélissier knows that the first rule of project development in France is to always contact the local politicians first, even before contacting the farmers. This practice served Pélissier well, and all local political leaders were soon backing the project. Another successful strategy, says Pélissier, was arranging one bus trip per month over a two-year period, allowing 60 local people to visit a cluster of wind turbines in nearby Luxembourg. Altogether, the twelve-person Erelia team took three years to complete a 32-MW project, one of the shortest development cycles yet in French wind energy. Not only are royalty revenues shared among adjoining landowners; local taxes are also shared among the many villages affected. It may surprise North Americans, but landowners with wind turbines on their land receive only 70% of the royalties paid for land leases. The remaining 30% is paid to adjoining landowners who have to live with the wind turbines, but who were not fortunate enough to have one on their own land. This practice has become common in continental Europe, especially in neighboring Germany, where they had to confront "Turbine Envy" much earlier. To spread the royalty benefits to as many landowners as possible, Erélia moved some of the turbines slightly from their ideal locations to neighboring properties. Similarly, Erélia worked with local landowners to avoid dividing the 30% of royalties into too many portions. They tried to limit payments to those farmers adjoining the property and within 80 meters of each turbine. Payments were also made to landowners for passage of roads and cables. Le Haut des Ailes has leases with 40 individual landowners. Royalties amount to about 2,000 Euros/MW or 4,000 Euros per turbine. 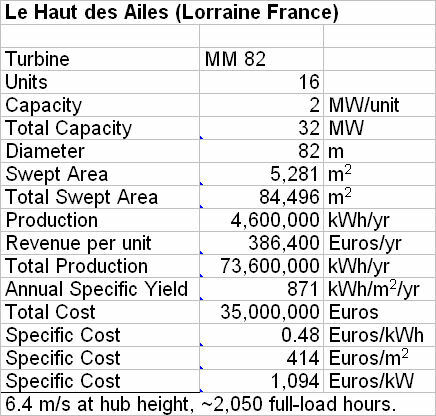 At the tariffs available under the French feed law, this is equivalent to ~10% of gross revenues per turbine. Throughout the negotiations, Pélissier kept all property owners informed. Each affected property owner was informed of what all the others would be paid. While this information was not made available to the public, it was provided to all property owners. This contrasts markedly with the secrecy common among royalty transactions in Canada and the United States. All told, Pélissier expects Le Haut des Ailes to pump about 200,000 Euros per year through the local economy from land rents, taxes, and revenue to local businesses. All interconnections in France are processed by the French state utility, EdF (Electricite de France). Developers need both a building permit and an authorization from the Minister of Economics to obtain a contract for interconnection and a contract to sell power under the French feed law. EdF performs an interconnection study upon request. Once the study is complete, the developer has three months to make a 10% down payment on the cost of interconnection. This forces the developer to walk a tightrope. If they don't have their building permit or are not likely to get their building permit in time, they can forfeit their interconnection deposit and their place in the interconnection queue. Pélissier preferred to pay for the connection study himself and wait until the building permits were near to approval before committing Erelia's money to the interconnection. It's a high-risk juggling act, and one of the reasons that wind has taken so long to take off in France after the feed law was introduced nearly a half decade ago. Erélia's Pélissier isn't finished; he hopes to build five more projects like Le Haut des Ailes. In the meantime he's considering an extension of the project with five more machines, bringing the total to 44 MW, the maximum possible on the local distribution lines. Pélissier wants to expand the regional development of wind energy in northeastern France through community involvement, using Le Haut des Ailes as a model. He may have a far wider effect than imagined. Within a few weeks of our visit, a delegation arrived from Quebec. They wanted to know how to build community-initiated wind projects on the windy Gaspé peninsula and keep the economic benefits in their communities. Le Haut des Ailes could be soon spreading its wings across the Atlantic.